Why do Companies Hold on to Bad Suppliers? The fact is that risk and soaring costs go hand in hand. And while a company may work hard to improve process, lower risk and improve predictability to drive down internal costs, the causes of low quality may come from sources that are not under company’s control. Or apparently not, anyway. It is in fact quite common that supply side issues are constant disrupters, adding to costs of inspections, returns or rework. In this article we look at the sources and costs of low quality (CoLQ). And we question why companies often overlook or accept problems in their supply chain as a driver of high costs in production, when, in fact, they do have the opportunity to exercise control on their suppliers. A common definition of Quality is the degree to which a set of inherent characteristics fulfill requirements. When talking about custom manufacturing, an effective execution on a complete set of customer requirements will result in the delivery of quantities of product that consistently fulfil the customer’s need. Consistently meeting customer requirements (or not) and maintaining satisfaction (or not) can be costly. Clearly the cost of maintaining high quality on the customer side can be high because quality through the entire production cycle, from supply chain to shipment, is difficult to measure. Problems may be unlinked to their causes. Companies also have problems deciding where to invest. Assuring quality (QA), through accurate planning and process implementation, may be a bigger expense upfront than implementing testing product on the back end (QC). Due to both complexity and cost, companies may choose to “live” with low quality and let that cost eat into their profits. The Cost of Poor Quality (CoPQ) typically falls into four categories: internal failure costs, external failure costs, appraisal costs, and prevention costs. Indirect costs may result such as loss of reputation, customer dissatisfaction or even law suites all resulting in loss of revenue. For ISO2001 companies, poor quality is not unsurmountable. This certification requires that there are processes in place and the “As-Is” process for every part of the product preparation is documented, from design to supply chain to manufacturing and test. So the collection of data (metrics) can provide feedback and through an effective change management system, improvements can be made. If quality goals are selected carefully and the outcomes of improvements are measurable, overtime the organization will see the benefits in terms of costs in all of the above mentioned categories, including the cost of appraisal and prevention. In their approach there is a focus on process, traceability, metrics, feedback and effective governance of corrective actions. The article enters into a little detail on each area of focus. For many organizations, quality-related costs go as high as 15 to 20 percent of their sales revenue. 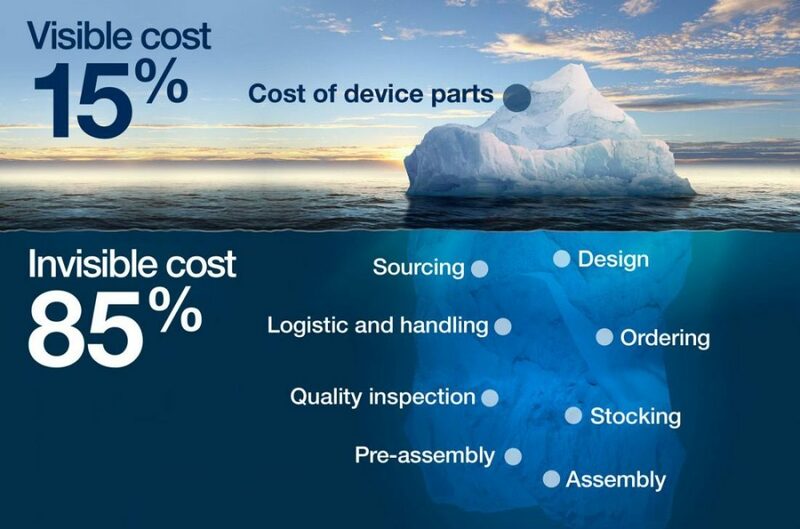 For those that implement quality management internally, these costs are often generated by poor quality from suppliers. Failing to account for problems in supply chains may lead to lost sale opportunities and higher costs. The damages caused by poor quality in a supply chain are amplified, as the COPQ of individual suppliers participating within a supply chain has a cumulative effect. So why do companies hesitate when addressing problems with suppliers? What is “good enough” or “generally pretty good” mean? No supplier is perfect and anyway, as companies evolve their quality management system, applying supplier selection criteria to current suppliers may prove awkward or difficult where relationships have been built over time. How are failures and issues identified and tracked? Is there a formal, documented process for reviewing issues and failures? How is corrective and preventative action implemented and measured to verify if the issue is solved? Is the supplier’s QMS integrated with their other systems and software? What reporting is available to their customers? It is good practice to address these questions even with historical suppliers and, if a supplier falls short, see if there are ways to help the supplier up its game and address weaknesses in its QMS, after all manufacturers should be looking for the best long term value from a supplier, not just the best price. Ultimately addressing supply chain low quality may prove too costly with an existing supplier and moving to a new supplier that already meets the criteria laid out by the selection process is needed. Researching and selecting a new supplier has an administrative cost and a perceived risk, both of which will drive resistance within the organization. However, while companies might assume switching suppliers is risky, the larger risk is often staying with a supplier that is a substandard performer and/or delivering lower quality product than needed.